Teenage Mutant Ninja Turtles...Pom Pom Edition! Over the weekend I found one of my old crafts I made when I was 3 or so. 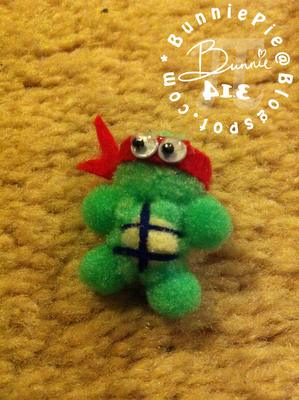 It was a pom pom ninja turtle glued onto a pencil. It was one of my favourite pencils because of that. It's pretty old so I thought it was time for a new one. So...I went and bought more pom poms! See the rest of them after the jump!